Curriculum design based on SDGs has a topic by level. Topics relate disciplines and improve the students’ competencies to be global citizens and take action. This project has a favorable impact on students, teachers, employees, families, and in general, the entire educational community. We are implementing our mission of empowering women who transform society, contributing to the understanding and management of the relevant problems of humanity, identified in the SDGs. The Social Studies Department teachers are the leaders of the new curriculum design. Other teachers work in alternatives of interdisciplinary approach around each topic by level. We began at the midterm of 2016-2017 school year. Our project involves the change of the entire school curriculum and it is not limited to the teaching of the SDGs. It is defined as an interdisciplinary vision. The project is interesting for teachers, applicable in the School and relevant to our, role as teachers that help students to be aware of social issues, and the importance that as citizens, we all have to be part of a network that defines the future. It is transformative because it complements the necessary competencies for global citizenship, one of which is taking action to become agents of change. The results obtained are the commitment of the educational community, the interdisciplinary vision and the concern for reflection aimed to take action. Colegio Santa Francisca Romana or “Pachas” is a school located in Bogotá, Colombia. It is committed to developing the human potential of our students and their self-leadership, in order to transform society and take care of the Creation. We strive to achieve these goals based on Franciscan spirituality, social commitment, service leadership, academic excellence through critical thinking, a global and intercultural vision, innovation and social entrepreneurship. 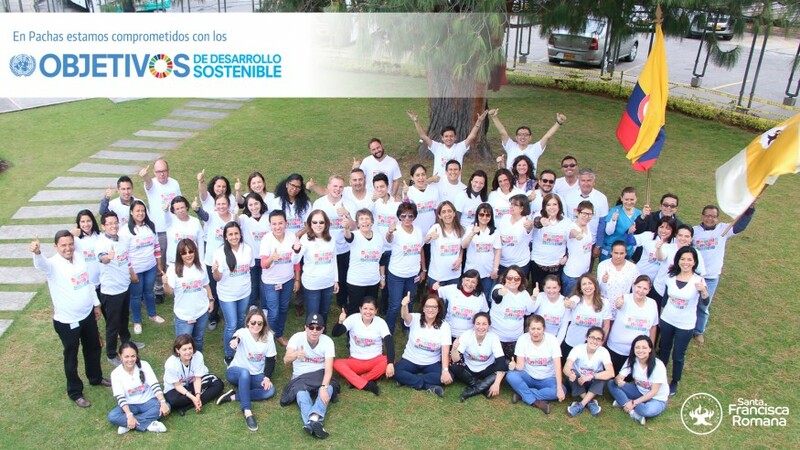 Pachas is committed with Sustainability Development Education, because our new curriculum is related to SDGs with the leadership of all Social Studies Department teachers and the Principal, but involving all Pachas community.